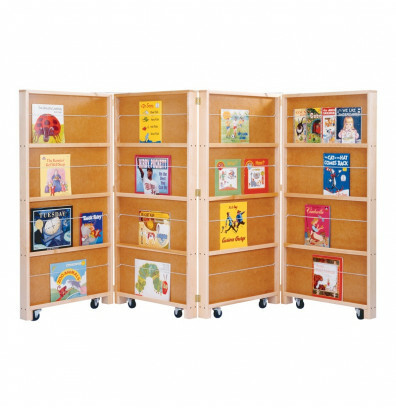 Jonti-Craft mobile library classroom bookcase features 4 hinged two-sided panels. Folds compact for space saving convenience. Swivel casters for solid mobility. Jonti-Craft 0267JC 4-section mobile library classroom bookcase offers a durable maple frame construction. Four hinged two-sided panels with elastic cord book holders. Rounded edges promote safety. Swivel casters for solid mobility. Foldable for compact storage. Well suited for elementary school environments. Ships fully assembled.